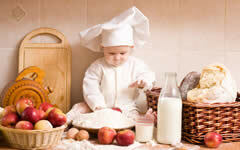 * Before you start preparing formula milk, wash hands with warm water and soap. After that, wash all the equipment that is used when preparing dairy formula. * Water saving bebi with which meal has to boil for at least three minutes, then pour in the hot bottle, cover, wait for it to cool, then add a quantity of powdered milk, mix well and place in refrigerator. Mleko course should not be too cold when you give your baby. * If your baby does not drink all the milk, dump the rest! Never let him suckle milk that stood for more than an hour outside of the refrigerator, and even what he stood for more than 24 hours in the refrigerator.